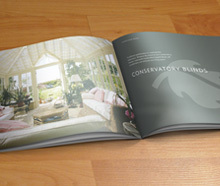 You are here » Home » Blog » News » Why Choose Conservatory Blinds? Escapism is something that every person craves – and a conservatory or garden room offers a peaceful sanctuary. In order to be able to create a haven in your conservatory, blinds are needed to regulate the temperature, prevent glare, and ‘finish’ the room. Without conservatory blinds, conservatories are victim to the extremes of the British climate – unbearably hot in the summer, and freezing in the winter. This is where Appeal comes in. With 20 years of experience Appeal offer sophisticated solutions to the problems faced by conservatory owners. Conservatories have lots of different uses, and this will affect your blind choice. Appeal’s blinds provide the personality and individuality that your conservatory needs. Blinds help make the transformation from having an ‘extra room’ to having a ‘fully functional room’. As well as providing privacy, Appeal’s ranges of unique blinds also have a much more practical function. 80% of summer heat gain and winter heat loss occurs through the roof of a glazed room. Appeal’s exclusive Alu-Peat® and Solar R® Blinds regulate temperature by reflecting an amazing 85% of the sun’s heat energy in the summer back outside, whilst insulating the glass space in the winter. The Alu-Peat® and Solar R® Blinds keep your conservatory the perfect temperature all year around without, what would otherwise be, excessive household energy bills! Appeals range Alu-Peat® and Solar R® Blinds are also popular simply due to their versatility and style. These blinds are the perfect solution to create a cosy, intimate atmosphere in your conservatory. Appeal offer the option to have all their blinds motorized so at the touch of a button your conservatory takes on an atmosphere of its own. Conservatory Blinds will give shading, insulation and privacy transforming your conservatory into your own private Eden.